I wrestle in my mind how much eat I should eat both for ethical and health reason. But when I am in Poland, which is where I live, I can not resist Polish Kielbasa, especially grilled. 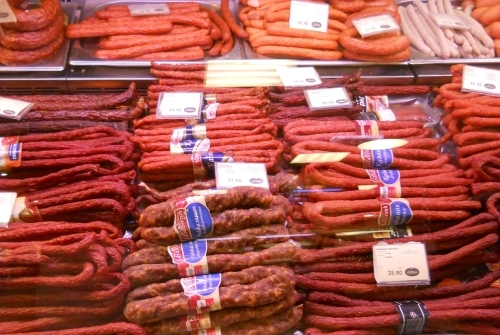 I do not know one person who could name all the kinds of Polish sausage, simply because there are too many to remember. Some of them are local products, too and you cannot just go to any store and buy it. Here are the most significant kinds. The name means ‘regular’, ‘usual’ or ‘average’. Zwyczajna is the common kind, almost always destined for grilling or frying on a pan. There are numerous types, such as Śląska or Podwawelska, but they are all similar in taste. Make sure you eat it with good mustard and a wheat roll or bread. It makes a good addition to scrambled eggs after it is cut into half slices and fried, too. This kind is boiled instead of smoking which makes it pale and not attractive looking. It usually goes with żurek, polish sour rye soup, sometimes they are even cooked together. I’m not a fan of this one, but a lot of people like it. It is the most controversial sausage- you can either love it or hate it. As a foreigner you are probably more likely to dislike it, but still give it a try. Kabanos is a skinny cocktail sausage, usually a spicy one. The more dry it is, the better it tastes so do not keep it wrapped into anything after you buy it, although there are low chances of kabanos to last until it is dry, you will most likely eat it the day you get it, this is what happens at my house every time. It is meant to be eaten cold. I have heard of someone making hot dogs with it, but I don’t think it is a good idea. A regular skinny sausage would make a better hot dog as it is not dry. Kabanos is a good party food too, you can make koreczki with it, which are pieces of kabanos or ham, cheese and bell peppers (or whatever you please) on a toothpick. Another one that is only served cold. Wiejska is the most favorite one and a must have at every Polish home on Christmas, Easter or anytime the family gets together. It tastes best with vegetable salad and country bread. Dry Kraków sausage, I have no idea why it is called dry sausage because it is not dry at all to me. Maybe it’s because it seems dry on the outside. It is mostly used for sandwiches, kind of like ham and is a good addition to vegetable salad as well. Although it is a chubby sausage, it is called skinny because it contains very little fat compared to other kinds. It’s just a really fat hot dog but often made with better quality meat, depending on where you buy it. There are more kinds that are not popular or widely available but these are the basics that you should try while visiting Poland. Funny, I just had to bone up on my Kielbasa knowledge for my first trip on my own to the Polish delis of Greenpoint, in Brookly, NY. I never knew that the type of kielbasa I had grown up with was podwawelska or what the real difference between Kabanos and Kielbasa was. I love biała kielbasa the best, always have. I prefer its spiciness to the smokiness of the others. Boiled, then baked with kapusta, heaven. Podwaelska next. But I may be odd, I love kiszka. I have never had (but want to try) Kiełbaski myśliwska (hunter’s kielbasa) and Kielbasa Weselna (wedding kielbasa. Poland is a beautiful place to visit. Visited Warsaw and my Mother’s home village near Białystok a few years back. Can’t wait to go back and see more. The thing that opened my eyes was the variety of pierogi, lol, never, ever had a meat one back home.